This post brought to you by Buca di Beppo. The content and opinions expressed below are that of http://afewshortcuts.com/. Graduation time is here and party planning is in full swing. I can’t think of a better thing to celebrate than the successes of our children. 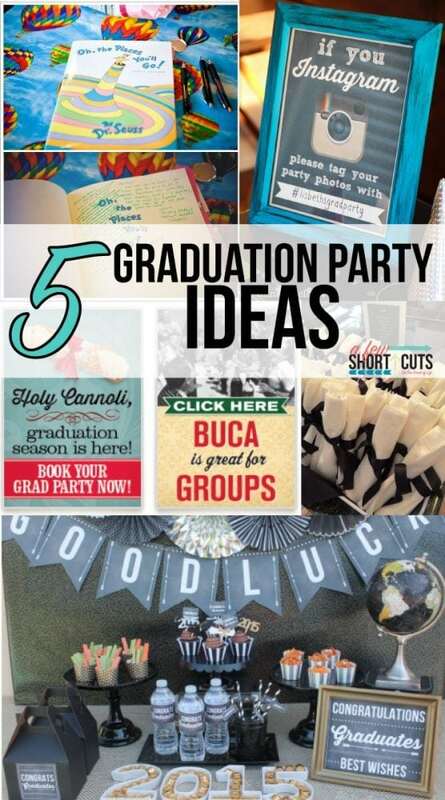 Here are 5 Fun Graduation Party Ideas! I love this idea no matter what size the party. Check out how cute and simple this Cutlery Wrapped to Look Like Diplomas is. Any one could do it! I am in love with all of these Grad Party Printables from CatchMyParty! There is a little bit of everything to make your party special! And this idea almost made me cry. Pull out your child’s old Oh, the Places you’ll Go! by Dr Seuss or buy a new copy. Have everyone sign a message to the grad! Thanks for such a great idea BlovelyEvents! Let your friends be the photographer! Check out this fun Instagram Themed Photos printable from The Thinking Closet. There are a ton of great instagram themed printables! Last but not least you need to choose a location for your party. 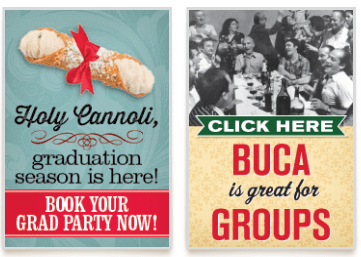 Buca di Beppo is the perfect place for your graduation party. They have a fun, eclectic atmosphere and delicious, family-style dishes perfect for sharing with your friends and family. I love that they have Comfortable semi-private dining rooms that can accommodate all of your friends and family. Plus, you can book your party online! Having a party at a location like Buca di Beppo where they handle the food and location takes a lot a stress off of the parents! I like the book idea. I also like to put out drink dispensers at a party so guests can help themselves. I love the idea of making the napkins look like diplomas. I love the little diploma napkins. I also loved the hash tag confetti for an Instagram party. I like to have as much prep done ahead of time with a lot of finger foods and fix it yourself bars. That way I can enjoy the party and spending time with my guests. For parties I like to keep a master list of what I need to do and make on one side of paper and put the grocery list right next to it. Helps keep me organized! These are such great ideas! I love the diploma cutlery! I like to put ranch dressing in the bottoms of small cups, the stand up sticks of carrot, celery, and pretzels in the cup. It is something even most kids like, very easy to eat at a party and clean up afterwards. I like to go overboard when planning parties and making sure that everything matches the theme and coordinates. I would love to be a little simplier in the future and be able to enjoy the actual party more! my favorite advice is to do as much meal prep in advance as possible. My son graduated high school last year and I wish I would have had this available last year! That being said, my daughter is leaving elementary school this year (5th grade) and heading to middle school next year. I think I’ll get the Dr. Seuss book and have her get it signed at school (along with her yearbook). Then I’ll get another copy after middle school and then again after high school – or maybe it would be fun to use the same book all three times, especially if she ends up with some of the same classmates through the years. My favorite party planning advice write a list of things to do, menu and games ask my family to help so it’s not all on one person and everyone can enjoy the party. Loved the ideas! My best party planning idea is to use a calender, put everything down with food prep or cleaning and just follow through. Like chopping veggies on wed, making sauces thursday and final touches friday..and this has really helped me. Also have a little back up plan. My Favorite Party Planning Advice is always to shop at your local Dollar Tree, they always have awesome party decor and supplies, perfect to keep the party within your budget. You know the Pirouette Cookies by Pepperidge Farm? You can make really cool (and easy) little diploma favors out of them by decorating then with white or brown chocolate bows. Maybe you could even use food coloring on the white chocolate to match school colors, but I haven’t tried that. My tip is to let others help and try to incorporate personal details. I always have a theme to go by and do a mock party in advance for close friends. My best party planning advice is to make lists! Don’t think that you will just remember everything that needs to be done. Better safe than sorry. Write it down and prioritize the list and work in order. My best advice is to take advantage of friends and family to not only help you plan and think of idea but to also get items needed for the event so you don’t stretch yourself too thin. Everything looks so pretty Amanda. I know your party ideas turned out great. My #1 tip is: Plan, Plan, Plan. Make things simple on yourself by using as many foods that are pre-prepared as possible. That way you have less stress and more time to enjoy the party yourself. 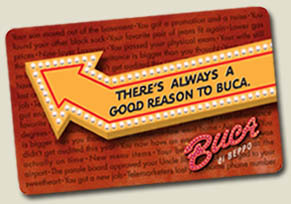 Thanks so much for the chance to win a Buca di beppo gift card. I hope you have a wonderful summer!